Since Chris had eight teeth pulled, I have been thinking about ways I could help keep our cats’ teeth clean. The vet says dry food is good for that which makes me question my choice of vets. I think dry food cleans a cat’s teeth as well as a cookie cleans a human’s teeth. I could try to brush their teeth but that would cause trauma and be a nightmare beyond belief. Floki, especially, would be impossible considering we can’t even trim his nails. Bones are natures teeth cleaner for cats but, even though I feed them raw cat food, I don’t give them bones. I’ve recently started including a few ground chicken wings with bones (the wingettes are all my food grinder can handle) but they need the entire bone to help their teeth. Chris barely eats his wet food the way it is, I can’t see him or any of our boys eating the entire chicken wing, although Frankie might attempt it. I recently came across Solredo Silver Vine Chew Sticks that claim to clean cat’s teeth among other health benefits. On Amazon they are labeled as “Matatabi Cat Catnip Sticks.” I assume Matatabi is another word for Silver Vine but Catnip is probably wrong since they are Silver Vine sticks. They arrived last week and I took three out of the resealable package and gave them to our boys with mixed results. They were interested at first but it didn’t last. Frankie even started playing with his Kitty Kick Styx. It seemed holding the sticks was much more effective after the initial interest subsided. Unfortunately, holding them is not realistic. Perhaps they should sell a device that holds them ten inches off the ground. Has anyone tried these? What do you think? This entry was posted in Uncategorized and tagged catnip, Cats, chews, Silver Vine, solredo, sticks on March 12, 2019 by Charles Huss. My wife ordered new Kitty Kick Styx for our boys for Christmas to replace their old ones. They arrived when we were away in St. Augustine for a long weekend. The neighbor, who was watching our cats, brought the mail inside. She noticed Chris tearing up the package so she put it in the hall closet. She then noticed that Frankie was attacking the rest of the mail, which probably had a catnip smell, so she put that in a kitchen drawer. When we returned, the neighbor came by to tell us where our mail was. When we retrieved the package from the closet, Chris immediately started trying to get into it. We then felt like saving it for Christmas would not work so they all got an early present. Frankie went absolutely crazy with his Kitty Kick Styx. Chris was a little more subdued but not much. Floki was cautious but he eventually warmed up to it. Has anyone tried these? What did your cat(s) think? This entry was posted in Uncategorized and tagged catnip, Cats, cute, funny, kitty kick styx on December 6, 2018 by Charles Huss. My post last week talked about how Chris can still be bad despite his age and weight and about him getting up in the cabinet to eat the flavor packet that came with the NomNomNow food. 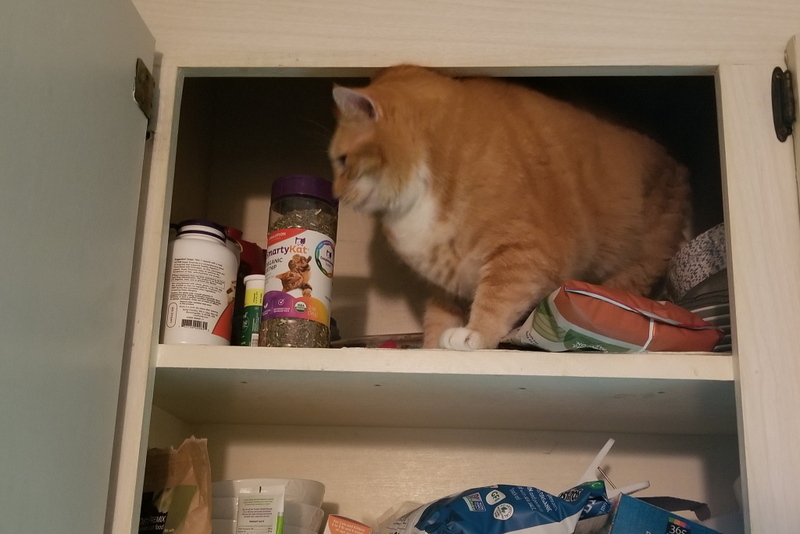 Now that the flavor packet is gone he is still getting up in the cabinet. I think he was looking for it but when he realized it was no longer there he spied the container of catnip. 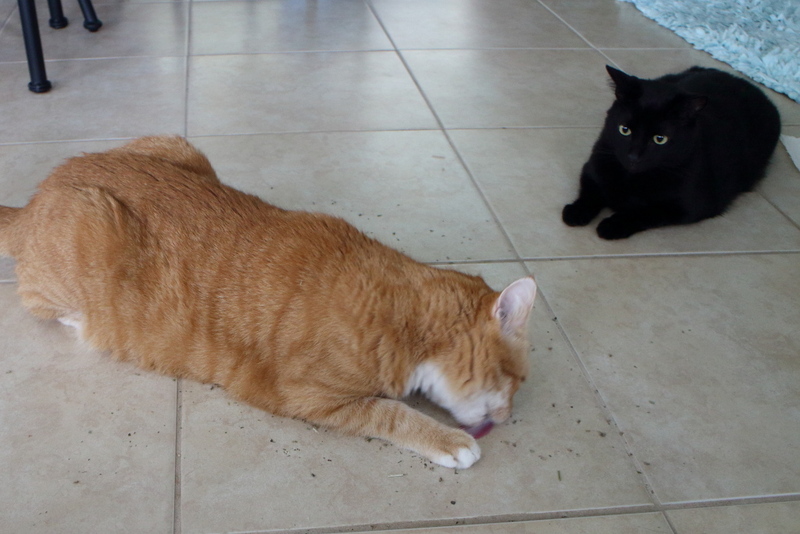 Naturally, as a punishment, I gave him some catnip. 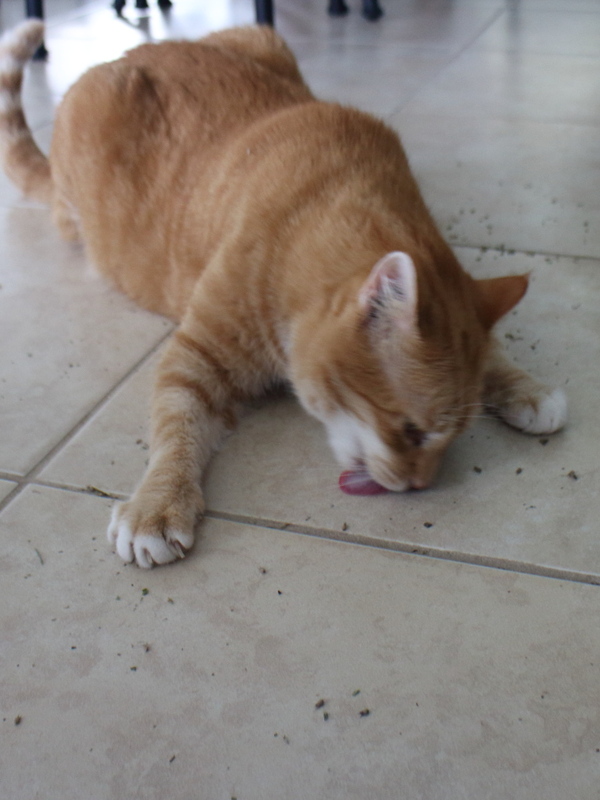 This morning I went out for a bit and returned to find the catnip on the counter. I guess he struggled to get it open and then gave up without even trying to hide what he had done. 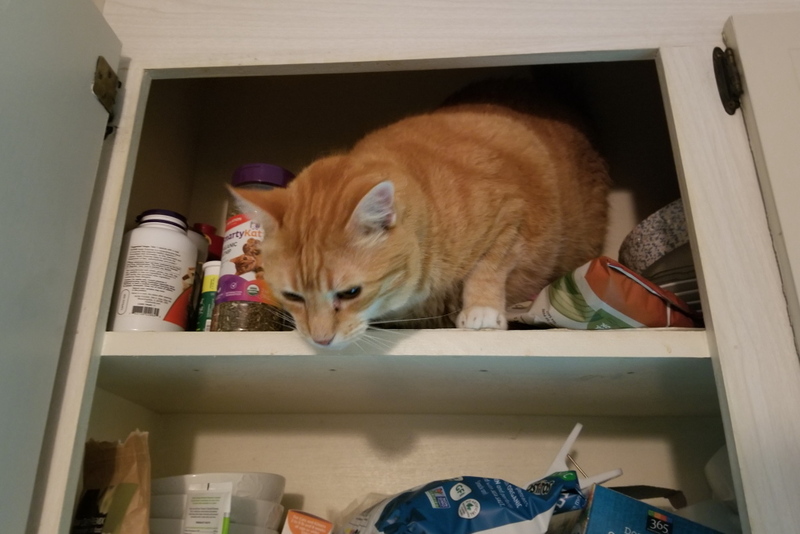 This entry was posted in Uncategorized and tagged Bad Cat, cabinet, cat, catnip, ginger on July 14, 2018 by Charles Huss. Perhaps Chris should be nicknamed “The Spoiler” for his ability to spoil a good time, especially if it is Frankie having a good time. Check out the video below of Frankie having fun with a catnip mouse. You may also remember a similar incident a few years ago. This entry was posted in Uncategorized and tagged catnip, Cats, funny, mouse on June 27, 2017 by Charles Huss. Recently we had catnip party and, as happens sometimes at parties, things got a bit out of hand. This entry was posted in Uncategorized and tagged catnip, Cats, funny on April 29, 2017 by Charles Huss. A couple of weeks ago I got an email from Ellen of the blog 15 and Meowing. 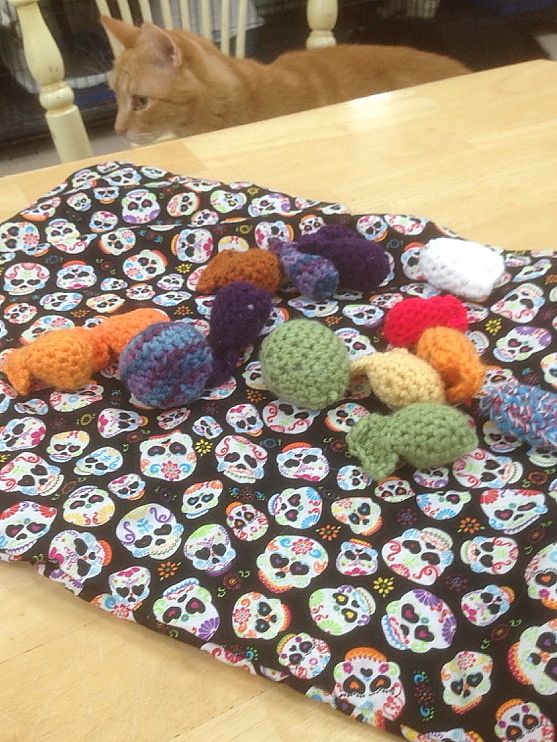 She said we won the prize in their Halloween giveaway, The prizes were supposed to be a catnip mat, a catnip ghost, a magnet and a button skull but when I asked that she send the prize to Chris’s old shelter, Sav-R-Cats, in Surfside Beach, South Carolina, Ellen decided to make more catnip toys, 20 in all, so the cats at the shelter could enjoy them. Isn’t she wonderful? 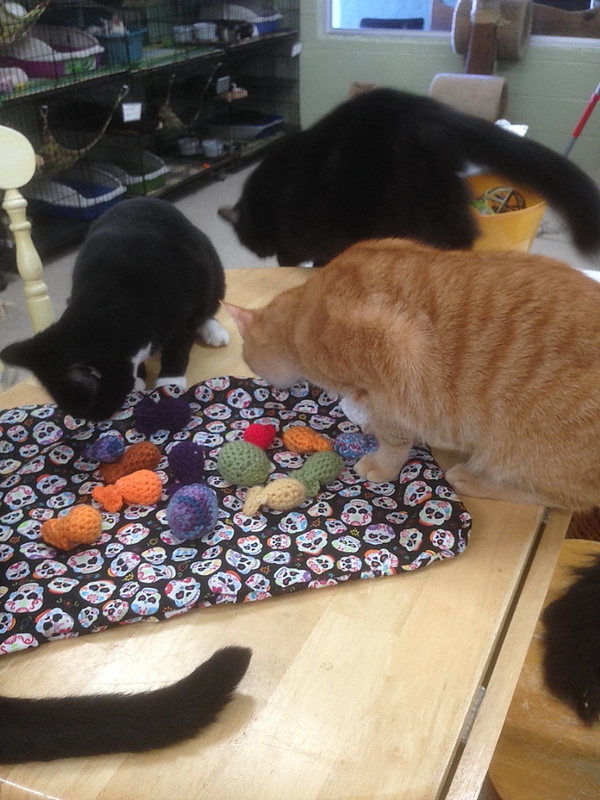 I got the following pictures from Shirley, the shelter manager at Sav-R-Cats, and it looks like the prizes were a hit. I’m grateful to Ellen and her crew and happy that these homeless cats have something to brighten their days a little. I know that they are well taken care of there, but I still hope all will find a loving home soon. This entry was posted in Uncategorized and tagged catnip, Cats, Myrtle Beach, prize, Sav-R-Cats, Shelter, South Carolina, surfside beach, toys on November 14, 2016 by Charles Huss. A few days ago I took the blender out of the cabinet and before i could close the door, Chris was in the cabinet. I knew getting him out would be difficult but I was certain I could lure him out with cat treats, so I took them out of the cabinet, that was right next to Chris, and made a big announcement that I had kitty treats. Puck and Frankie came running but Chris held his ground. 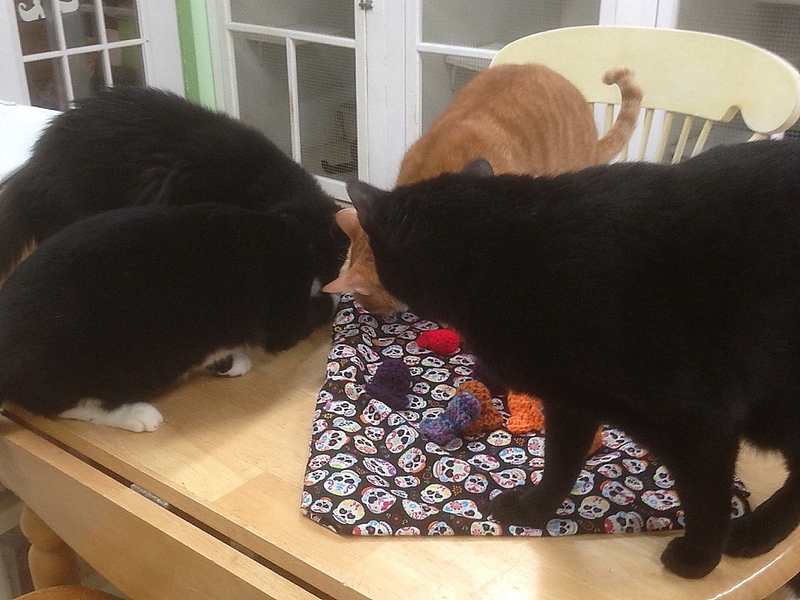 I passed out the treats to the boys, thinking Chris would not be able to resist, but when I looked back, he was gone. 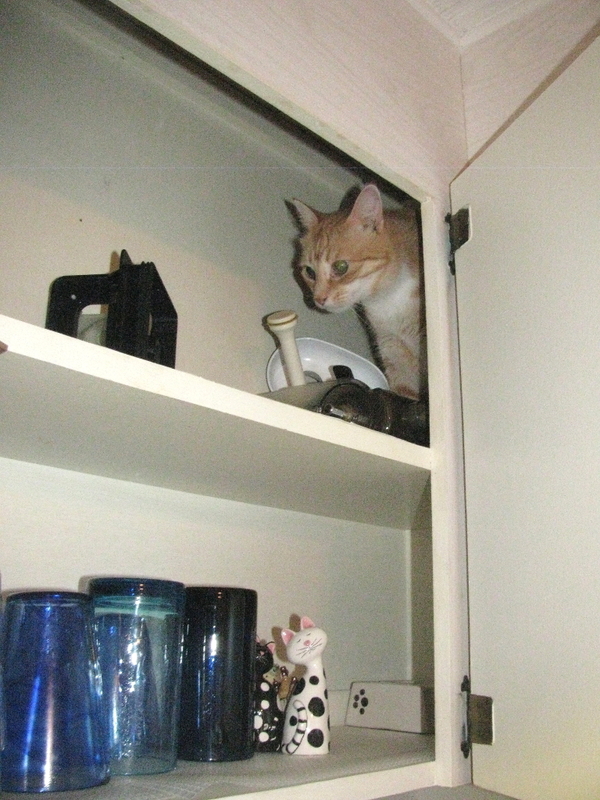 He didn’t leave the cabinet but made his way the five or six feet, over all our clean dishes to the other side. The cabinet above the sink has three large doors and no dividers between them. When I opened the door on the left, there he was chewing on the catnip bag. 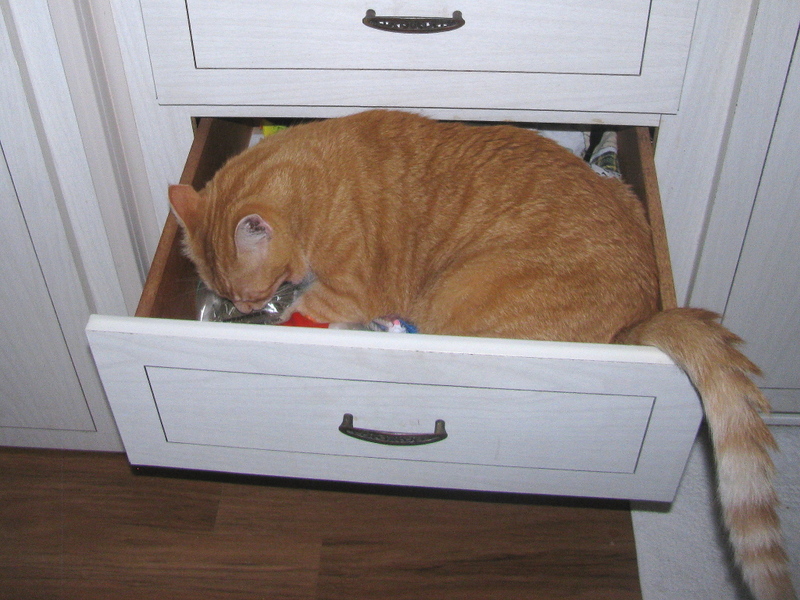 I moved the catnip there after he managed to find it in one of the drawers. (see “Catnip, I Have You Now“). I took it away from him and thought about pulling him out of the cabinet but that would have resulted in some of our good dishes crashing to the floor. 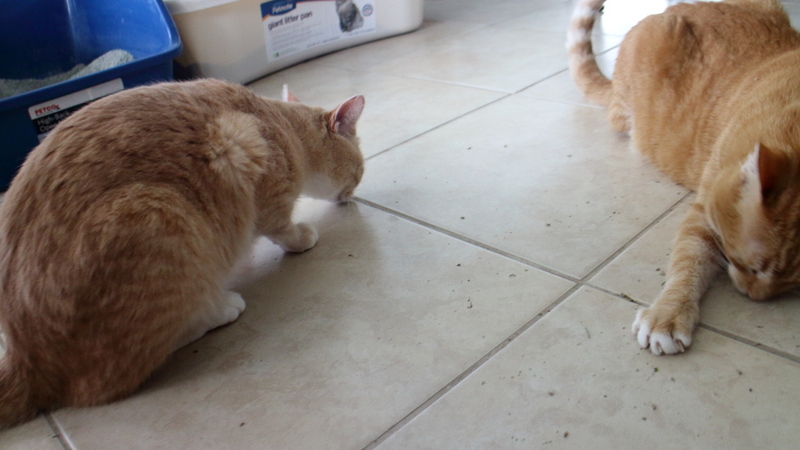 Instead I had to reward his bad behavior with the catnip. 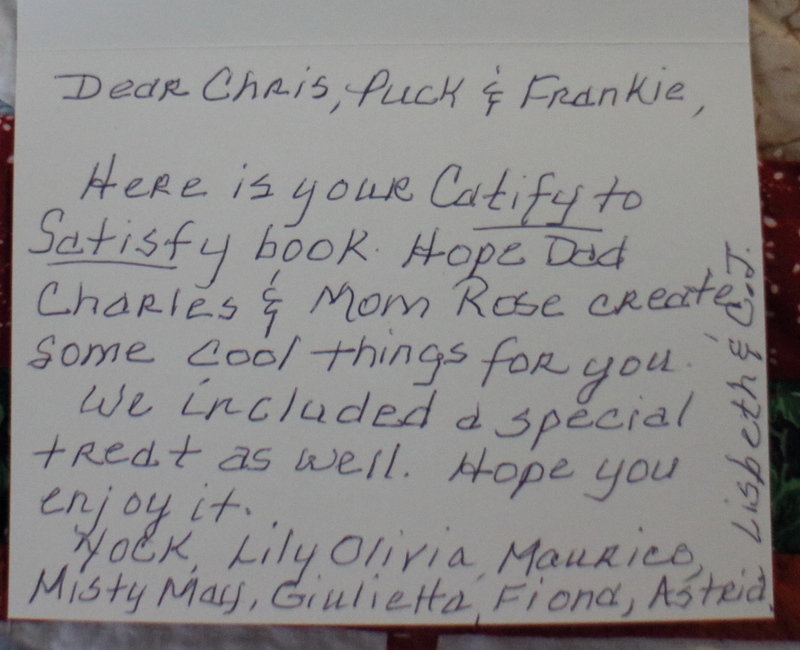 This entry was posted in Uncategorized and tagged bad behavior, catnip, Cats on June 22, 2015 by Charles Huss. Catnip, I have You Now! I was making dinner Monday night and I opened a drawer to get something out. When I tried to close the drawer, Chris had both paws over it and I couldn’t push it shut. I could have pushed him off but I had to stir my food and I thought it wouldn’t hurt to let him look for a second. After all, it was just kitchen stuff. What could he possibly want? I forgot about him for a minute and saw him inside the drawer when I turned around. I thought it was a cute picture so I grabbed my camera to get a picture of him before I got him out of there. I kept calling his name but he wouldn’t lift his head so I could get a good shot. It was then that I realised that he was ripping something apart. I quickly picked him up and saw a good portion of a bag of catnip spread all over the drawer. Now I know where we keep the catnip. This entry was posted in Uncategorized and tagged Bad Cat, catnip, funny on June 10, 2015 by Charles Huss. 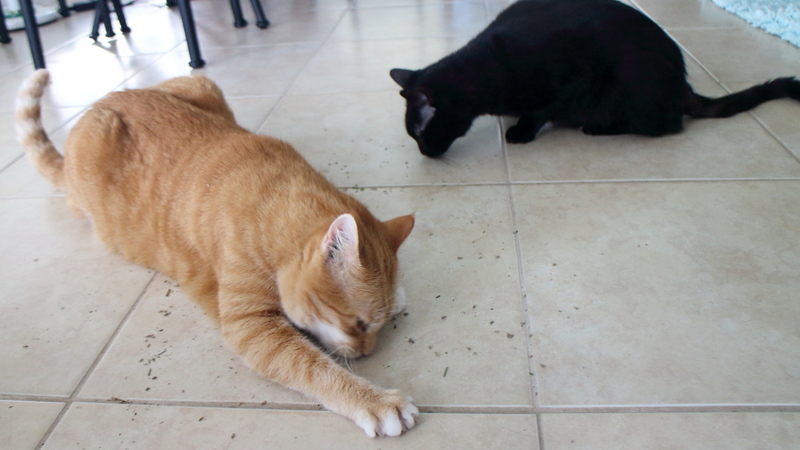 A little catnip in our house carries a lot of entertainment value. 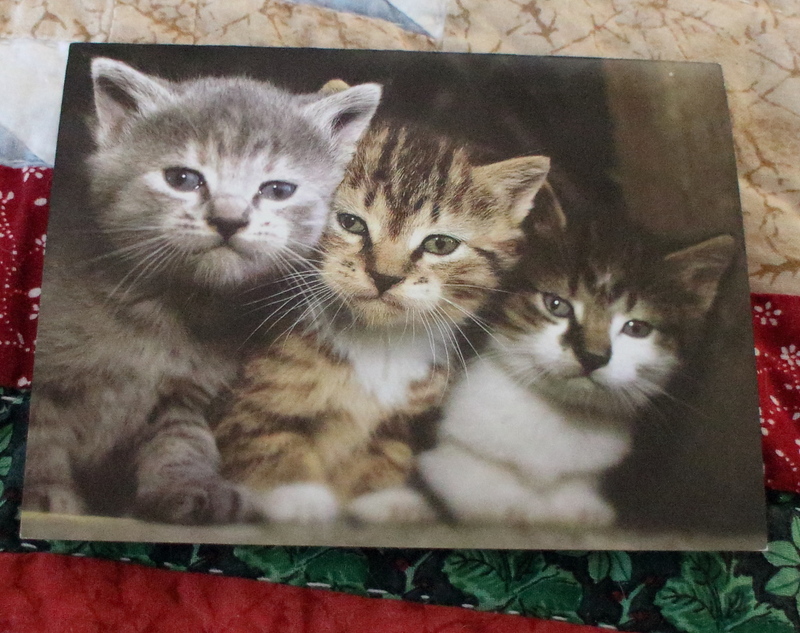 One of our cats was badder than the other two. See if you can guess which one. This entry was posted in Uncategorized and tagged Bad Cat, catnip, funny on July 15, 2014 by Charles Huss.